Volcanic basalt lava rock, abundant, tenacious and extremely durable. Basalt, time proven to stand against the elements for thousands of years after its surroundings long since eroded away. Using a set of proprietary melting technologies a specific mineral mixture (breed) of crushed basalt rock is heated to a 1450 degrees Celsius. The melt is stirred for 6 hours to become 100% homogeneous 100% natural liquefied golden brown basalt glass. Very special machinery draws the white hot material through 1600 holes in special ceramic bushings. These white hot fibers are stretched to align their molecular structure and attain the desired diameter. They are then quenched with a preparatory sizing resulting in a resilient fiber tendon substantially stronger than steel or man-made white fiberglass. The sizing deposited as it cools the fiber also enhances both durability and the speed with which our epoxy polymer coats each fiber in the production RockRebar®﻿. 1. After considering a conservative rating to allow for any possible material flaws or misuse; RockRebar® ﻿ is much higher tensile strength than steel or fiberglass rebar of the same diameter yet is still only ¼ the weight and well over 2.2 times stronger in tension as compared to grade 60 steel! 2. High strength + perfectly balanced thermal expansion with Portland cement + Zero rusting ever = RockRebar®﻿ being the best tensile reinforcement for panels, decks, beams and pilings. 3. 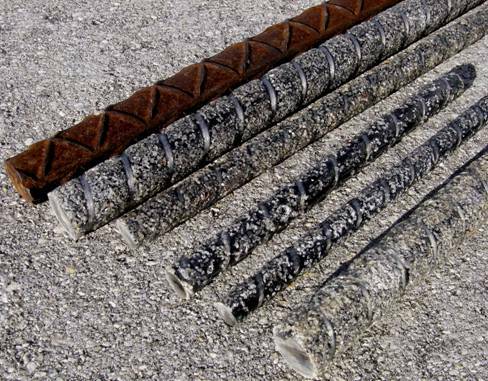 Since Rock Rebar®﻿ (basalt rebar) is not metallic and does not absorb water it cannot rust! 4. No rusting allows RockRebar®﻿ to be placed with only ¾” coverage of the rod and the surface of the concrete as per ACI 440-6. This reduction in coverage requirements allows for more flexible designs potentially resulting in using less heavy and expensive concrete. 5. RockRebar®﻿ is the perfect reinforcement for today’s popular pervious concrete (low fines, 25% porous, water passing concrete). Pervious concrete reduces water retention or run off problems. RR allows reinforcement with no fear of rust spalling (splitting). (See new section) RockDNA®﻿ “street grid”. 6. Compared to steel, the very high tensile strength of continuous basalt fiber allows for smaller diameter reinforcement rods. Since there is no rusting issue, RockRebar®﻿ may be placed within only 0.75” of surfaces where its tensile strength and high cycle tenacity can add stiffness without weight. 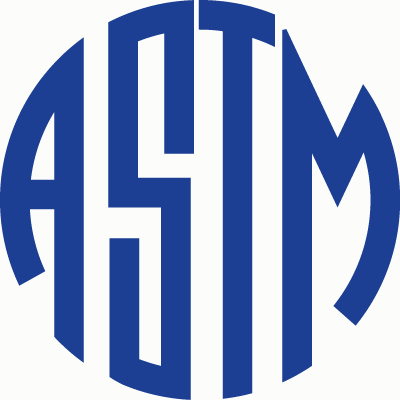 Generally speaking, to add panel or beam stiffness we recommend that more rods in small size be installed in critical structural designs as opposed to going with larger diameter reinforcement to. The inherent design flexibility in adopting RockRebar®﻿ as non-rusting concrete reinforcement provides potential for many creative options. NOTE: The placement of RockRebar®﻿ near surfaces thereby offsetting it well away from bend axis of a panel or beam allows room for the addition of more rods to offset Tensile Modulus issues if they arise in engineering calculations. 7. RockRebar®﻿ is much lighter than steel rebar. One man can easily lift a 650' coils or #2, 3 and #4. As a result many jobs will no longer require hoists or forklifts to handle reinforcement. Workers comment they feel much less fatigue installing RR as compared to steel. A reduction in injuries and medical expenses can be expected. Weighs over 41 pounds or nearly 19 kilos. Weighs about 12 pounds or about 5.5 kilos. Lighter weight to handle yet RR is at least 2.2 times stronger than steel in tension. In a tensile to tensile comparison, the weight ratio is one lb. of “RockRebar®﻿" can replace 9.6 pounds of steel! Perhaps reinforcement size can be reduced by adopting RockRebar®﻿. For example #4 (12 mm) RockRebar®﻿ is about a match in strength to grade 60 #5 steel. We recommend a tighter grid of smaller "RockRebar®﻿" ( basalt rebar) to obtain the best price to performance. Its light weight allows for much faster installation and a better overall job. Our standard "RockRebar®﻿" sections are 39'6" to ship in a 40' container; however diameters of up to 12mm in 650’ coils for shipment. 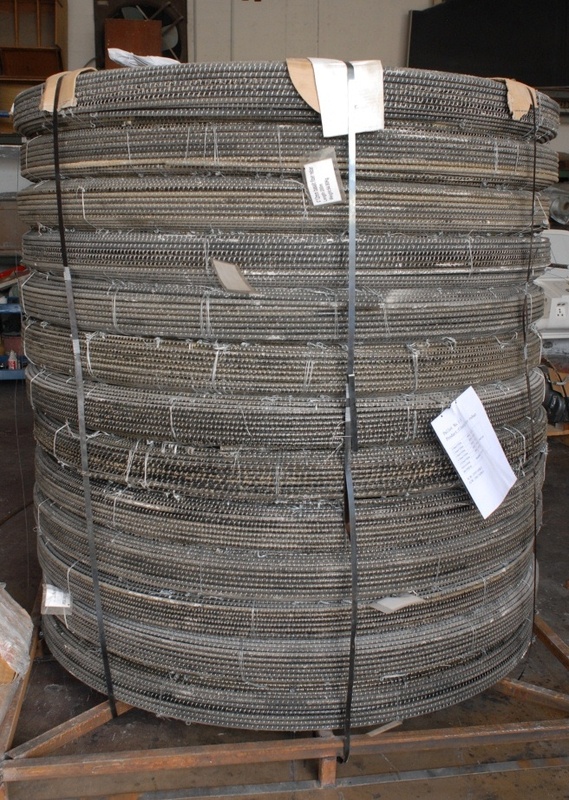 These coils have proven invaluable in long runs such as bridge decks and sea wall caps. 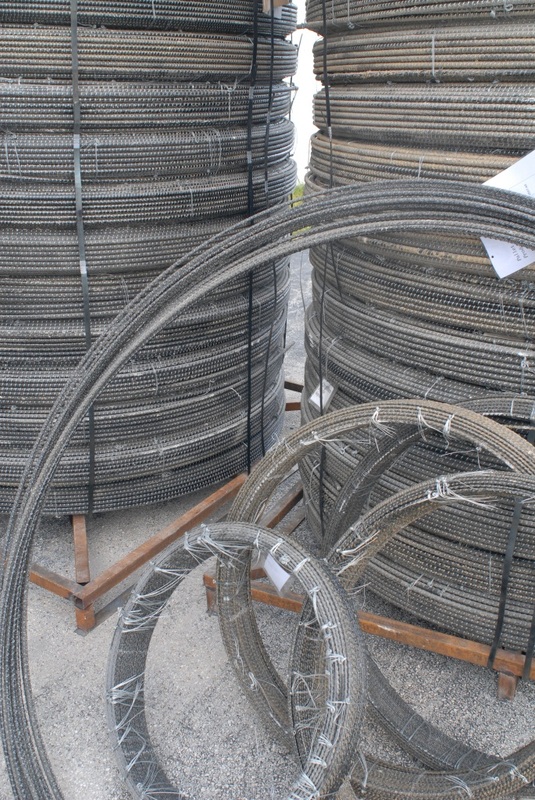 RockRebar®﻿ coil material wants to spring out straight and will naturally straighten when unrolled. RockRebar®﻿ CAN NOT be heated and bent. 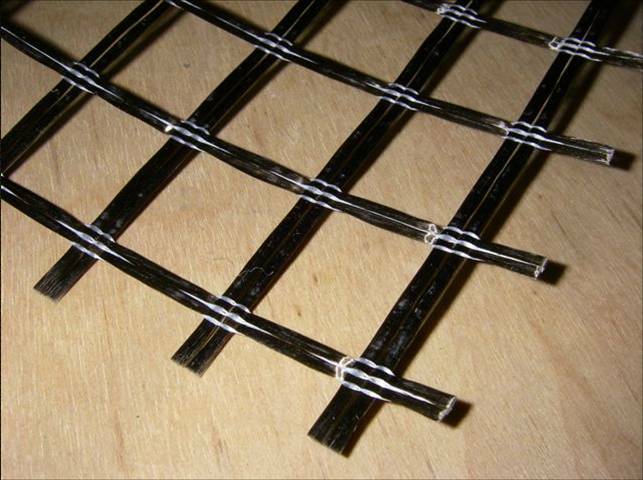 We “DO” make “RockRebar®﻿” corners that can be wire-tied in the traditional manner. Some people do mix steel corners with RR straight sections. We mold custom size RockStirrips®﻿ round, square and rectangle for construction of cages. While NOT normally an issue, engineers must consider Tensile Modulus when calculating the reinforcement layouts of highly loaded construction. By nature as with most composite materials “RockRebar®﻿” is much higher in tensile and lower in Modulus strength than steel. Therefore: “IN SOME CASES” RockRebar®﻿ may not be a direct replacement! However: From a practical standpoint when RR is installed in a properly engineered pour, the bending limit will be much higher than the crush of the concrete. 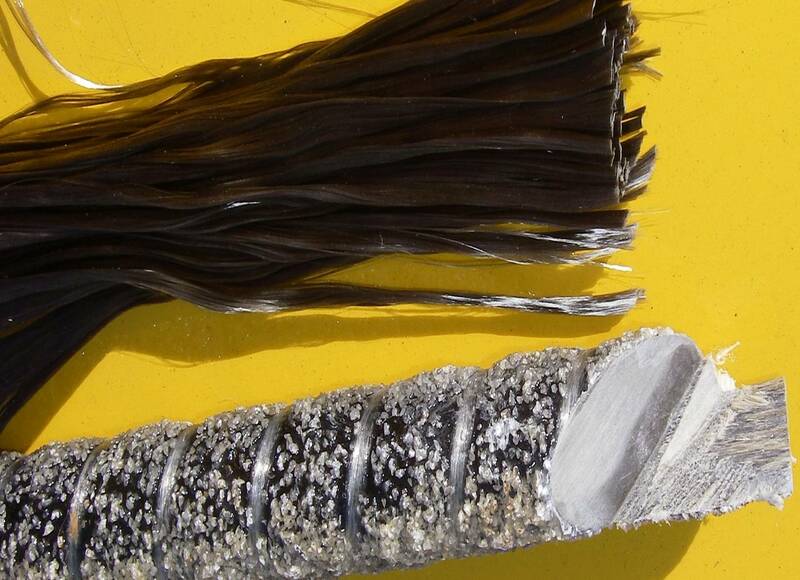 Excessive deflection can be avoided by capitalizing on continuous basalt fibers high tensile strength and simply modifying the reinforcement layout by placing RockRebar®﻿ closer to the surface of the concrete. In extreme cases by adding more RockRebar®﻿ in smaller diameters engineers find the resulting calculations overcome any Tensile Modulus issue altogether. 8. RockRebar®﻿ has exactly the same thermal coefficient of expansion as concrete. 9. The most attractive structural feature of RockRebar®﻿ is that takes on loads in tension precisely in step with the natural tinsel flex of Portland cement making continuous basalt fiber the best possible answer to crack control! 7. “RockRebar®﻿” is naturally resistant to corrosion, rust, alkali, and acids. RR cannot rust, so spalling of concrete from moisture penetration is totally eliminated! RR does not need a special coating to resist the high ph. from exposure to concrete like fiberglass rod requires. 8. RR does not absorb and transfer moisture like glass fibers do. Exposed fibers will not create a path for water to penetrate and destroy concrete. 9. Epoxy hole glue achieves and maintains optimum adhesion, yielding very high pull out. 10. Does not conduct electricity. 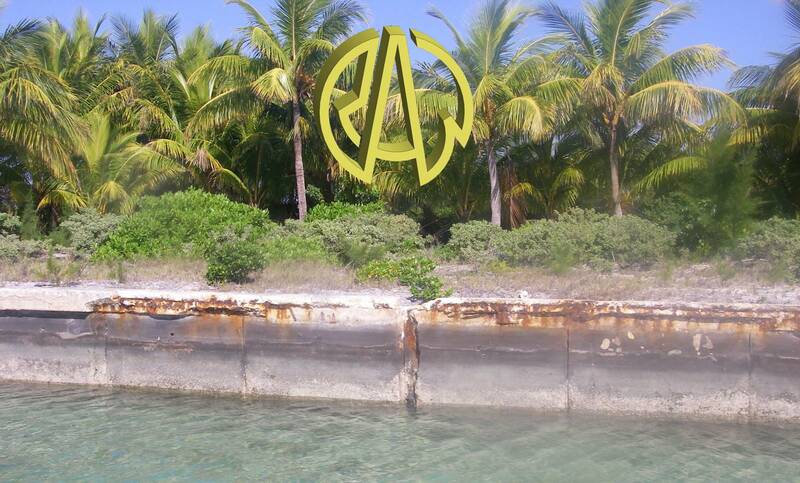 This prevents electrolysis in marine applications. 11. Nonmagnetic does not induce fields when exposed to RF energy, so it can be used in applications like MRI rooms and around RFID readers. 12. Easily cut to length in the field with common tools. 13. IMPORTANT NOTES FOR SAFETY: Steel stretches and bends. “RockRebar®﻿” has a lower stretch. When pushed to its bending limit, it will rupture and just snap off cleanly. In a properly engineered pour pullout or rupture is very unlikely. However an example of how you can mishandle RR is attempting to pick up a panel by some exposed section of ”RockRebar®﻿” (a hoop for example). In short, “RockRebar®﻿” is so strong in tension and allows for so little stretch, that it can exhibit a brittle, clean break right at the exit point of the slab or the hook point of the lifting devise. As this can be dangerous, we strongly suggest workers be taught how to properly use and install RR. We suggest “feeling” what is referred to as a “linear stress to failure curve” by the actually experiencing it. As an experiment to stress RR to its Ultimate Shear Strength, place a (#2 or #3) 6-10mm diameter piece in a vise and bend it until it snaps. You will find it takes a surprising amount of force. “RockRebar®﻿”. Notice also will NOT stay bent unless it is held; once load is removed it returns to its naturally straight position. This feature makes RockRebar®﻿ an excellent reinforcement in seismic areas. 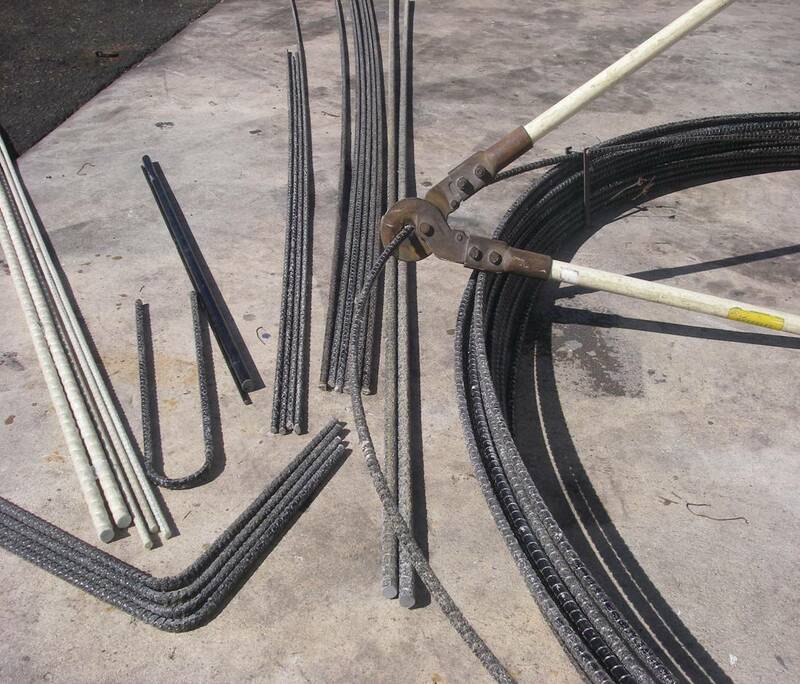 In MOST concrete reinforcement applications “RockRebar®﻿” can be used as a replacement for steel rebar. For specialty applications such as marine environments and chemical plants, where corrosion resistance is a major concern, no other product can come close to matching “RockRebar®﻿” in cost performance!